Kaniz Zohra Ajmali discovered the secret of a confident career hand-in-hand with a good AMCAT score. Learn her secrets to a successful interview. 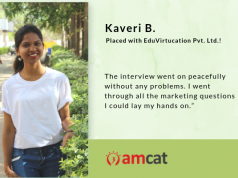 Handle interview questions with confidence like this AMCAT achiever did. Does the AMCAT Test actually help? We asked numerous people that got an inbox full of positive answers. While it is hard to share the hundreds of success stories, we decided to bring a few to the fore and get in touch with them. For today, we are covering the story of a particular AMCAT achiever, Kaniz Zohra Ajmali. Let us hear her success story in her own words. A MCA graduate, Kaniz Zohra Ajmali started her career like many like her; with a successful AMCAT Test. She took the AMCAT Test in her college and from there went on to grab a job of Quality Analyst with XOR Labs in Noida. Her journey is inspiring and we decided to get in touch with the lady herself to gain more from her experience. “It was nice. The question paper was a bit lengthy, but it was well organised and extensive”, says Kaniz, our AMCAT achiever of the day. After how much time of giving the AMCAT Test did you receive your first interview call? Ones the calls started coming, there was no stopping the flood. Her experience of the job interview reflected her confidence and she found the whole process nice and smooth. 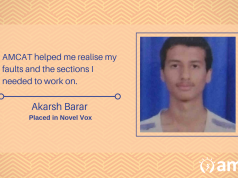 Kaniz sailed right in the job market and grabbed the best of fresher jobs with a job at XOR labs. Any word of advice for the job seekers out there? Confidence is an important key to bagging a great job and Kaniz Zohra Ajmali seems to have already learned this secret. She also advices that you should go down to the nitty-gritty of the subject and the position you are being interviewed for to feel and be confident. 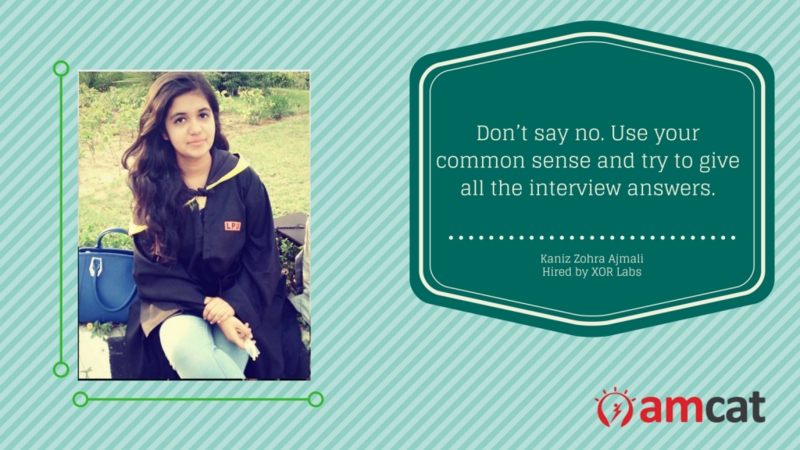 Kaniz Zohra Ajmali with her victory story, interview tips, and never-say-no confidence is surely someone to look up to. 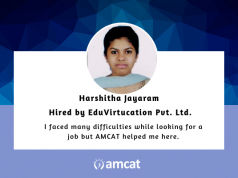 You too can write your own success story with AMCAT and get a chance to feature on our AMCAT achiever blog. If you have already given the AMCAT Test then look through our AMCAT jobs section to find your perfect fit. You can also look for fresher jobs or jobs defined by area to make your job search easier. If you haven’t given the test yet, then schedule one now and let us hear your success story and mantra.